In YC114 each major empire faction, having been embroiled in a harrowing, extensive, long-term war, recognized the growing need for support and logistics functionality in their vessels during the kind of protracted interstellar warfare that might otherwise prove exhausting for its participants. In the Gallente Federation, this led to the redesign and redeployment of the Navitas. The Navitas had been a solid mining vessel that had seen wide use by independent excavators, along with being one of the best ships available for budding traders and even for much-maligned scavengers. After its redesign, its long-range scanners and sturdy outer shell gave way entirely for remote repairing capabilities, moving the Navitas away from the calming buzz of mining lasers and into the roar of battle. The Navitas is the Gallente Logistics Frigate; Navitas pilots repair their fleetmates’ ships during battle. 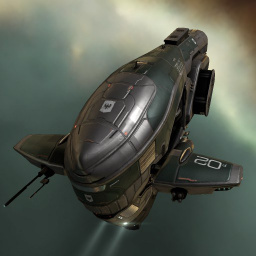 The Navitas is bonused for remote armor repair, which matches the Gallente racial focus on armor tanking. The ship’s bonuses to remote armor repairer amount, activation, and range make the underwhelming base stats of small remote armor repairers practically useful. Flying the Navitas is a great first step in learning about Logistics. Navitas pilots often go on train into heavier Tech I logistics cruisers (such as the Gallente Exequror), and then Tech II logistics ships (including the Thalia and Oneiros). But the Navitas is also effective all on its own, especially as a component of frigate or destroyer gangs, where speed is key. Compared to the Amarr Inquisitor—the other Tech I armor logistics frigate—the Navitas has less tank and less native capacitor. The Navitas is fine, but frigate logi pilots are encouraged to cross-train into the Amarr logistics frigate if they can. Watch your capacitor, and deactivate modules when they aren't needed. As explained above, you may not have enough capacitor to run every module, all the time. When you first land at an engagement, you’ll need to use your MWD to position yourself relative to the fleet. But then, once you are in position, you won’t need your MWD any more. Remember to turn it off! Likewise, as your fleetmates start to take damage, it’s easy to overreact by activating all three repairers at once. Instead, try to activate them gradually, one by one, to see if you can spare capacitor by running just one or two. And if you need to switch targets—say, because the enemy fleet has changed their primary—again, switch gradually. Stay moving, behind your fleetmates. One advantage of the Navitas is its small signature radius, which makes the ship difficult to hit. But this is only an advantage if you aren’t sitting still, so always be moving. Given this, you might be tempted to right-click your repair target and “Orbit at…” your optimal range. Keep in mind, though, that this will sometimes send your fragile frigate closer to the enemy than the damage dealers. Better, instead, to manually fly in a ring orbit behind the fleet, so that you keep range and stay out of the action. This page was last modified on 24 February 2019, at 14:35. This page has been accessed 102,599 times.